The definite popular winner in the minds of fans is the possibility that Blizzard might announce Diablo IV. DIablo III was launched in 2008, which means it is 10 years old. New and improved technology makes it possible to upgrade the game engine and expand the Diablo universe. However good that sounds, I am a sordid naysayer of this idea. I know it might bite me later, but here is my reasoning. Blizzard is launching Diablo III: Eternal Conflict for the Nintendo Switch on November 2. It doesn’t make sense to announce Diablo IV at this juncture. Why would you buy it now when a better version is coming, and that Nintendo Switch online community might dwindle later on? What Diablo IV would do is basically create a migration of Diablo III players onto the new game. It’s pretty hard to find a group in Diablo III nowadays, far less if Diablo IV launches. What I would do as a developer, and this is extremely far-fetched but an open possibility, is to migrate Diablo III assets into the Diablo IV engine so that the Diablo III and Diablo IV community are one and the same. Back-compatible. For example, Blizzard didn’t launch World of Warcraft 2.0 as a separate game. Instead, they upgraded the WoW engine, and migrated the assets of WoW vanilla and Burning Crusade into World of Warcraft: Cataclysm. Why move to Diablo IV when you can expand the Diablo III landmass and creatures? Diablo III players only have access to Westmarch (Khanduras), Tristram (Khanduras), Arreat Crater, Caldeum (Kehjistan). That’s it. That is all we have in Diablo III’s Sanctuary. The logical thing to do is to revisit Diablo II locations with contemporaneous story, and/or visit new lands we have never experienced in any Diablo game, but that we know exist. 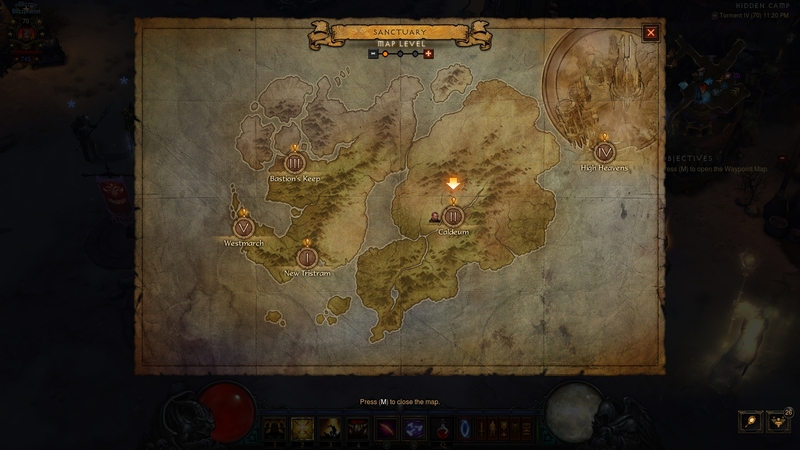 There are even landmasses within the zones that are unexplored in any Diablo game or that are unnamed. So I ask… why move to Diablo IV without actually adding the entire world of Sanctuary to Diablo III? Why separate the lands we already explored in Diablo III, with new lands as a separate game? Want to visit Lut Gholein? Play Diablo II. Want to visit Westmarch? Play Diablo III. Want to visit Xiansai? Play Diablo IV. Really? That’s a mess. What makes sense is a unified world that you can explore and delve into. My vote is on a Diablo III expansion where you can keep the community in one server for group queue, where you have your characters and their progression intact. This possibility has been there. We don’t have a Warcraft IV. We have World of Warcraft. 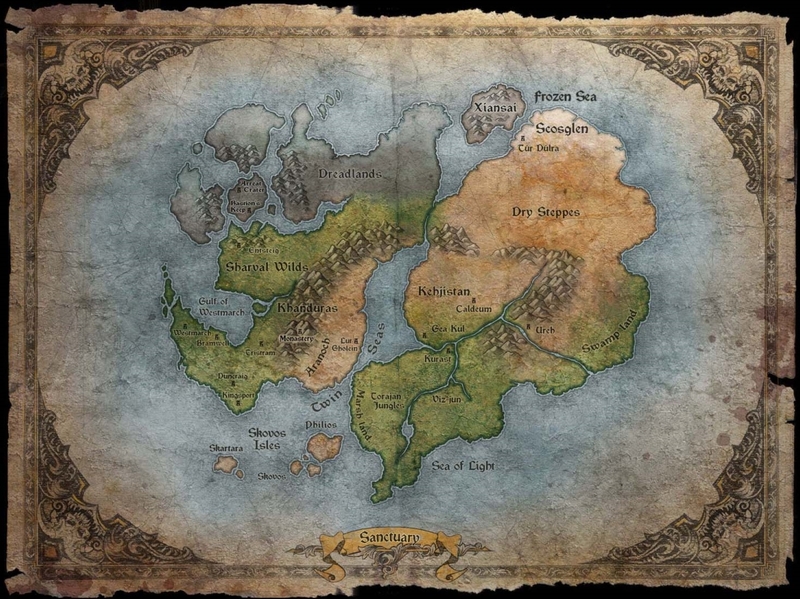 It is a massive unified world of Azeroth that keeps growing. A Diablo MMORPG would be in direct competition with World of Warcraft as a subscription-based game, but not necessarily. Take as an example Destiny 2. You don’t pay a monthly-subscription to play Destiny 2, which has dungeons, raids, and the equivalent of daily world quest scenarios. Instead, they release a new expansion every 4-5 months for $39.99 and it also has the equivalent of an in-game store for cosmetic items — basically justifying a free-to-play model with alternate and optional lucrative revenue. I don’t know if there is a Diablo MMORPG in the works, or whether it will be free-to-play or have a monthly-subscription, but either way might work for Blizzard. The problem with a Diablo MMORPG is that it is no longer a Diablo dungeon-crawler action RPG. The other problem would be whether Diablo III would still have expansions while a Diablo MMORPG is available simultaneously. We have never seen new Warcraft III expansions after the launch of World of Warcraft, for example. And should I remind you, it is been 15 years since the launch of Warcraft III: The Frozen Throne. Nevertheless, a Diablo MMORPG would be an interesting project with enormous possibilities, considering the sheer landmass of the World of Sanctuary, and that doesn’t even include Pandemonium, the Burning Hells, and the High Heavens. There is also the fact that Blizzard Entertainment teased there are many other worlds beyond Sanctuary in wait to be explored. What’s the source of this nonsense I am talking about? The answer is: Diablo: The Sin War Trilogy by Richard A. Knaak. If that’s not a tease for you, how about the coincidence that Diablo: The Sin War Trilogy is slated for reprint on 2019? The first book of the trilogy is coming just few months after BlizzCon. Diablo: The Sin War, Birthright is slated for March 12, 2019. Something tells me it is not mere coincidence. That’s the book where we were introduced to Angel Inarius and Liith (daughter of Mephisto) as the founders of Sanctuary, and co-progenitors of the Nephalem. Well, this one is certainly shocking. Overwatch is a team-based multiplayer first-person shooter, and if you have been under a rock the past year, Overwatch League has become a big eSports community. Blizzard Entertainment has worked on Diablo III PvP for years, and the old team’s directors no longer at Blizzard had scrapped whatever they had. Diablo III PvP has never been possible for whatever technical reason. How about creating a Diablo PvP experience outside of the box as its own separate game, then? Launching an Overwatch sister as a Diablo game, would not only allow us to visit different Diablo maps, but give us the opportunity to have a Diablo eSports. Would it be like Overwatch, though? (First-person), or is there room to make something akin to Heroes of the Storm? Diablo PvP would be welcome regardless of what type of genre or shape it comes up as. DANNY: So, obviously, there is a new announcement: Battle for Azeroth. Obviously, you are not going to announce anything but how is the team thinking about Warcraft II, and bringing that to modern systems, because that is a game that I think that a lot of people still likes to play? BRIAN: Of course, we have talked about what is next for the Classic Games team. Those kind of things like bring back Warcraft I, Warcraft II, Warcraft III, Diablo I, Diablo II… everything that we have is technically open to doing so. What we are focusing on now is actually the games that we know that are still being played and loved by a lot of people… Warcraft III, and Diablo II getting those up onto the modern Battle.net platform. Making sure that their experience with those games that are still being played, work well with all of our other titles, and still have the same amount of love that we get to all of our new titles. That was a very wild marketing stunt. It opens possibilities for Hearthstone to not be Warcraft ONLY. But StarCraft and Diablo-themed as well. With the Book of Adria, Bestiary coming up soon, and the fact there are tons of creatures across Diablo II and Diablo III, and multiple zones to visit in Hearthstone-Diablo expansions, there is room for a Diablo card game. As well as 12 classes: Barbarian, Witch Doctor, Wizard, Sorceress, Crusader, Druid, Assassin, Amazon, Necromancer, Demon Hunter, Monk, and Paladin.